Extended Gas Check for 6mm ? 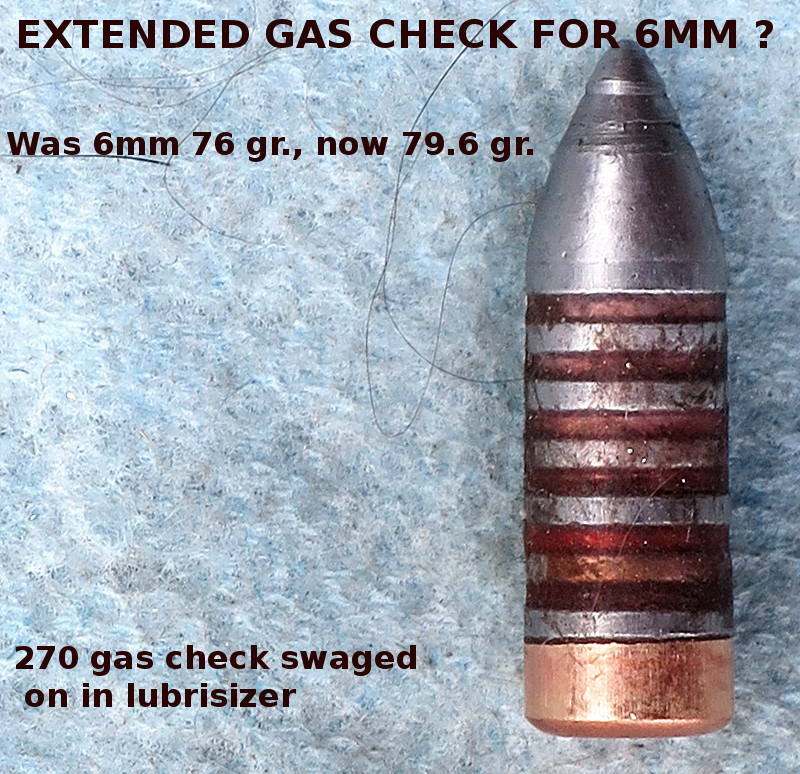 I've had more problems with gas checks coming off 6mm than any other caliber, and no wonder -- the 6mm check is a puny little thing that doesn't have much holding onto the bullet. So I started looking around to see if there was a deeper check that might fit. Well, a 270 check is quite a bit deeper, and has a 0.253" ID. Would a 270 check swage on to a 6mm bullet? Why yes, it does. This first attempt was not perfect, it would probably be better to use a bullet that let the top of the check end up in a lube groove instead of having the top of the check bump into a band like this guy. Nonetheless, the concept seems do-able. The next step is to shoot some of these and see if there is any accuracy advantage, particularly at high velocity? If I fail to seat the 270 checks squarely it might hurt accuracy rather than help.